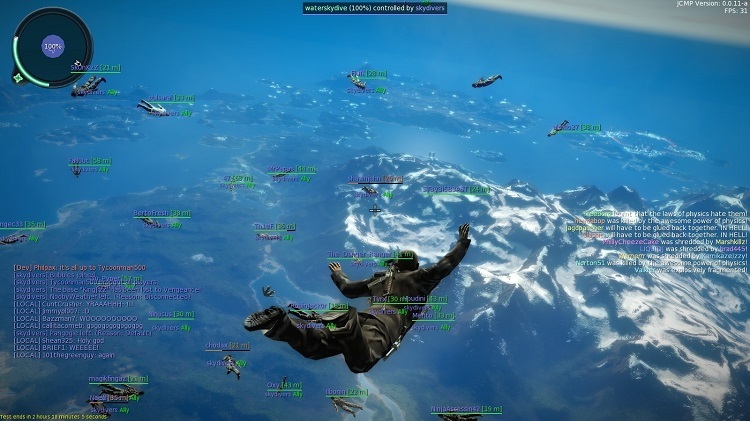 Square Enix' chaotic sandbox adventure game, Just Cause 2, was released all the way back in 2010. The title boasted a mindlessly entertaining single-player campaign, but hasn't been "relevant" to the gaming community in a while. That's all about to change, and those of you that have long since uninstalled the game may want to reconsider loading it back up, thanks to an upcoming multiplayer mod. "Since August, we've been in radio silence, working hard on the mod. We've hinted at a big surprise, and we think it's time to finally let everyone in on the big secret: On release, you'll be able to download the client and server from Steam, just like a normal game. This means complete Steam integration, including joining on your friends and more:"
Before we see an official release date developers will host a final Beta event, just to make sure they have worked out all the bugs. Anyone can take part in this week-long event, which Larkson touts as the "biggest demonstration of chaos this year." If you're interested in testing out the multiplayer romp you can grab a key here. Once you've got your key you'll need to activate it via Steam, by going to the "Games" dropdown menu at the top of your Steam window and then clicking the "activate a product on Steam" link. Once the beta opens, on December 7th, the activated game will unlock itself and you'll be able to hop onto the test server. The beta will end on December 14th, and according to developers the game should drop sometime soon after. According to Larkson, a detailed changelog will be posted two days before the test, and a release date will be revealed afterwards. Be sure to get out there and grab your key for this entertaining looking mod.